We have seen in recent seasons--especially since 2000--how fast teams develop (or regress) from week to week in today's NFL. Indianapolis and the New York Giants, recently, made Playoff runs by getting better and better each week while avoiding the injury bug. In fact, injuries contribute greatly to the flux we see every week in teams rising and falling on the various power rankings out there. The Football ERA helps to track these trends and generally reveals how hard and focused a team practices and prepares every week in its development. There has been so much flux in the past few seasons that we almost have to look at the long football season as a conglomeration of at least four different seasons---one for every month. Here is the cumulative scores from all the teams--including byes, of the results so far from the first month of the 2008 season. Keep in mind that one of my first posts last season cautions that this result, by no means, is a Power Ranking. With Baltimore, for example--despite the fact that the Ravens have played well, their score is a bit inflated as a result of beating up on opponents on an easy schedule and having benefited from an early bye in its early season calculations. 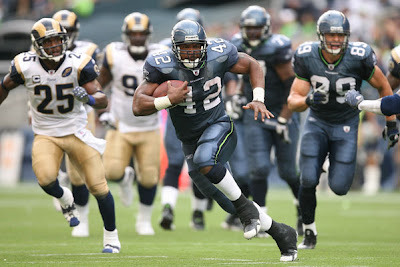 Seattle has been up and down in its Football ERA rating, but finally got a win out of its efforts against the lowly Rams. Football is a bit of a whacky game in that the final outcome is often not dictated by the team that attempts to control the line of scrimmage--given things like turnover, red zone efficiency, broken plays, special teams and the like. 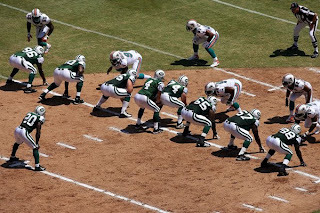 The Football ERA attempts to look beyond these factors and open field plays--that often determine the outcome of games--to bring a unique perspective to game analysis by viewing it from a different angle--one more centered around what happens in the trenches. Seattle's Football ERA ratings have not been as low as their win-loss record so far--particularly in Week 2 when they let the 49ers back into the game. They have made just enough mistakes to shoot themselves in the foot thus far this season before St Louis helped them begin to turnaround their early season woes. 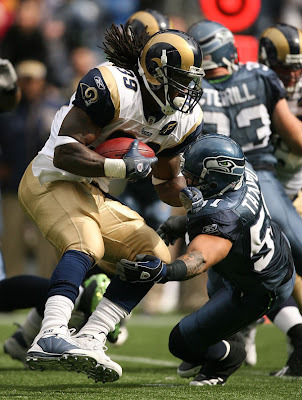 The St Louis Rams suffered from more adversity and injuries in 2007 than almost any other team in the league. Their starting lineup was in complete turmoil and had more changes week to week than any other team. Sometimes this adversity can serve to build depth on a team's roster by giving valuable experience to younger players on the depth chart. However, the Rams lineup has been anything but stable since 2007, and their performance thus far in 2008 has reflected this. Seattle's lineup, in contrast, has benefited from much more continuity as they work to right their ship in the right direction while the season is still young. Here are the lineups that Seattle and St Louis have fielded so far in 2008 with changes from 2007 and/or previous weeks highlighted in Bold. 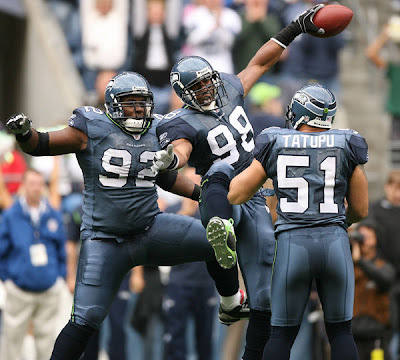 On Defense, all three starting linebackers from 2007 returned to the starting lineup for 2008. 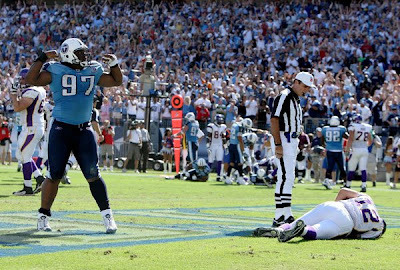 DT Brandon Mebane from California replaces the departed DT Chuck Darby--now playing for Detroit, while rookie DE Lawrence Jackson from USC replaces DE Darryl Tapp from the 2007 lineup. DT Craig Terrill started in place of suspended DT Rocky Bernard in Week 1, but Bernard returned to the lineup in Weeks 2 and 3. On offense, Free-Agent Guard Mike Wahle was brought in from Carolina to replace the retired G Chris Gray while steady backup G Floyd Womack filled in for the injured G Rob Simsin Weeks 2 and 3. Also out of the lineup due to injury is Right Tackle Sean Locklear who has been replaced by T Ray Willis so far in 2008. LB Brandon Chillar is now a Packer and has been replaced by the promising 2nd year LB Quinton Culberson. Top draft choice rookie DE Chris Long is starting in place of James Hall who was inserted in the lineup in Week 3 for the injured DE Leonard Little. On offense, Guard Adam Goldberg played for injured former Titan free-agent acquisition Jacob Bell in Weeks 2 and 3. Bell had replaced Mark Setterstrom (who is on IR) from last season's lineup while C Nick Leckey won the starting center job from Brett Romberg. The Football ERA calculated several dominant victories in Week 3. The formula is not meant to provide an authorative review of everything that occured during the game, but provides insight by looking at what happened in the trenches from a different angle than judging an outcome by the final score. In this case, Baltimore mounted drive after drive but were not always fully successful in the red zone. Some of their drives ended in turnovers while others only produced field goals. 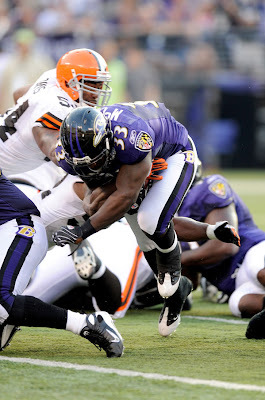 The formula credits the Ravens for its dominating ball control performance, particularly in rushing the ball against a Cleveland defensive line that was missing DE Robaire Smith who was put on IR. He was replaced by Shaun Smith. Also LB Willie McGinnest was also out of the lineup against Baltimore, replaced by Alex Hall. Meanwhile, the offensive line was shuffled to compensate for the absence of Guard Eric Steinbach who was replaced by the veteran Seth McKinney. The Ravens return most of their starters from 2007 when they did some significant rebuilding on their offensive line which included adjustments for the loss of OT Tony Pashos to Jacksonville via free agency. Eventhough they have started the season without the significant contribution that they got last year from NT Kelly Gregg, they have made the adjustment with DT Justin Bannan replacing him in the lineup---in part because Bannan gained valuable experience in 2007 playing for injured starters. The offensive line has been completely shuffled from 2007 with surprisingly positive results thus far--mainly because the 2008 starters played in many games last year while the Ravens were battling through injuries on their offensive line. Adversity can provide an opportunity for players to get experience for later productivity. Jared Gaither replaces the retired pro-bowler Jonathan Ogden but has been no slouch as he played frequently last year along with Ben Grubbs, Jason Brown (who is replacing the departed Mike Flynn at center), and Marshall Yanda. Chris Chester also started last year and will therefore provide valuable depth as a backup. Here are the starting lineups for the Ravens and Browns with changes from 2007 and/or from last week highlighted in Bold. 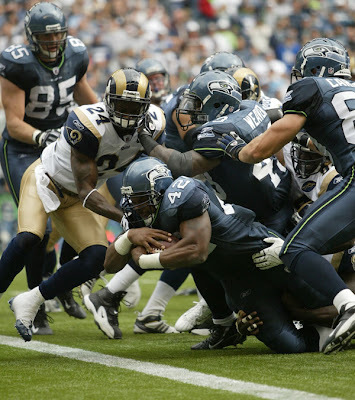 When two teams score positive points within 500 points of each other or less using the Football ERA, the result is indicative of a relatively even battle on the line of scrimmage. Cleveland battled a tough Pittsburgh team and held up fairly well in the battle of the trenches up front. 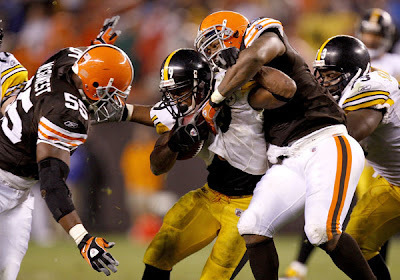 Pittsburgh won the battle of turnovers and scored a Touchdown whereas the Browns kicked Field Goals. Nevertheless, the Football ERA rewarded the Browns for having more drives that were longer in length than those of the Steelers. Their performance on drives left them with a positive 155 points after the formula subtracted out 45 points defensively for a strong rushing performance by Willie Parker. But they gained 250 points on their own Rushing performance which included 125 points for their Rushing 1st Downs. They also added a little over 200 points for Defensive Pressure which reflects their 3 Sacks and 9 QB Hurries and Pass Defenses. But the Browns failed to convert their drives into touchdowns while ending 2 of their drives on interceptions. Pittsburgh took advantage of one these interceptions and drove for a touchdown, making them more efficient on drives into the red zone in terms of scoring points. They earned their 346 point Football ERA score by Rushing the ball effectively along with earning points for defensive pressure in the form of 2 Sacks and a dozen or so QB hurries and pass defenses. Both the Browns and Steelers put the same lineup back out on the field in Week 2 as they started in Week 1 except for the insertion of Rex Hadnot at right guard for Seth McKinney into the Cleveland Offensive Line. 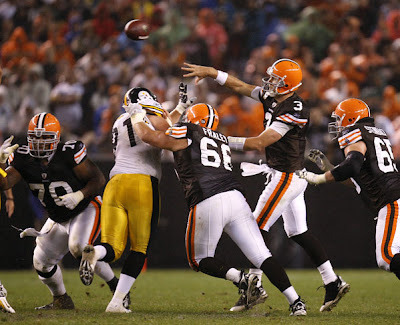 There were a few changes for each team from their starting 2007 lineup with Cleveland making changes on their defensive front whereas the Steelers mainly replaced a starter on their offensive line. Here are the lineups with changes from 2007 highlighted in bold. 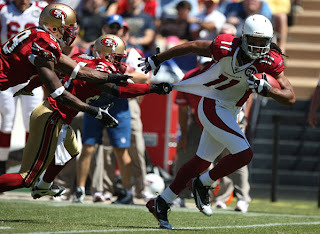 How Solid was Arizona's Victory over Miami? How solid is a victory when analyzed by the Football ERA algorithm when both teams score positive results, and there isnt a great difference in the spread between their results? In most cases, the team that comes out ahead has posted a good victory, but if their opponent gets a score that is a positive number, then they have earned their score by doing some good things on the field as well. This is because, normally, the algorithm scores both offense and defense, resulting in a negative score for the team that goes up against a dominant performance. In other words, a great performance pushes an opponent into the negative the higher a team earns positive points. As the formula calculates positive results on offensive gains, for example, the opposing team loses points on defensive calculations as well. Thus a dominant performance by one team over another ends up producing a result where the team that keeps accumalating more and more positive results pushes their opponent further and further into a negative result. 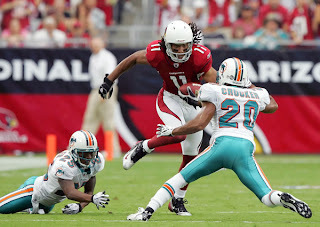 In the case of the Cardinal's victory over the Dolphins, Miami did a lot of good things to stay in the positive while ultimately losing out to a performance where Arizona did a lot right to earn a result that shows they had done more to control the line of scrimmage. Miami was able to make some positive strides in the loss despite shuffling their lineup against a decent Arizona Cardinal team that returned all starters from Week 1 (see earlier post on Arizona's Week 1 win over the 49ers). The Dolphins, on the other hand, lost Rookie right guard Donald Thomas to an injury during their week 1 loss to the Jets and started Ikechuku Ndukwe in his place. On defense they rotated in more of their younger burgeoning players as reflected by the changes in their starting lineup from week one (highlighted in Bold). Let's look at the some of the matchups that constituted what could be called a solid victory for the winning side. The Chicago Bears ran the ball and stopped the run against an Indianapolis team that is not the same up-front that it has been in the last few years of championship runs. That's not to say that the Colts will struggle all season, necessarily. The Colts have been resilient to changes in their lineup over the years, jelling as a unit at the right time like in their championship run when they had let teams run all over them before the postseason. 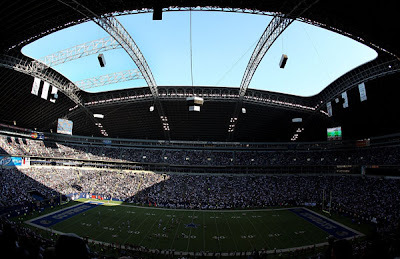 However, Indianapolis may certainly face its share of challenges early in the season. Speaking of championships, it was the Bears that Indianapolis faced in the Super Bowl when it made its storied run. But it was not the "same" Bears they played Sunday. Which may be one of many factors that kept the Bears out of the playoffs last season following the year they won the NFC Championship. The Bears retooled the interior of their defensive line in following their appearance in the Super Bowl. 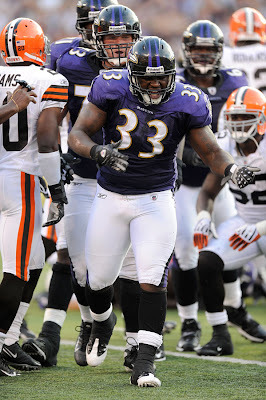 They brought back DT Tommie Harris, of course, but most of his sidekicks on the inside were gone by 2008. They also battled injuries and other challenges in 2007 that allowed their younger players to grow and gain experience. 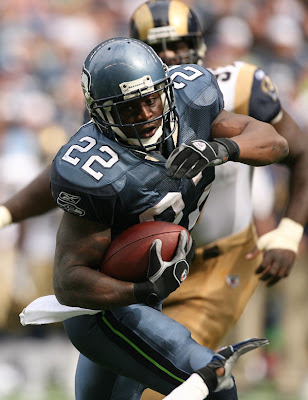 They bring most of those players back for the 2008 season. The offensive line has a new face in OG Josh Beekman who takes over for the departed Ruben Brown. Veteran OT John St.Clair steps in at left tackle but is not exactly inexperienced as he has been in the lineup often over the past several seasons. Judging by the rushing performance of Rookie RB Matt Forte, the new look on the offensive line was a success in the opener at Indianapolis. DE Alex Brown was no stranger to action on the field on the defensive side of the ball---with DE Mark Anderson substituting in to rush the passer. Young DT Anthony Adams was not activated for the game. Here is how Chicago looked up-front against the Colts on Sunday. As usual, changes from 2007 are highlighted in Bold. The Indianapolis Colts rose to be one of the perennial winning teams in the AFC by developing an offensive line that is dominant in pass protection while still maintaining a balanced and efficient rushing attack. 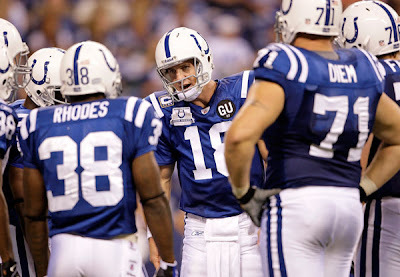 The further the defense molded to Head Coach Tony Dungy's Tampa Style Defense after he arrived in Indianapolis, the further the team advanced into the playoffs. 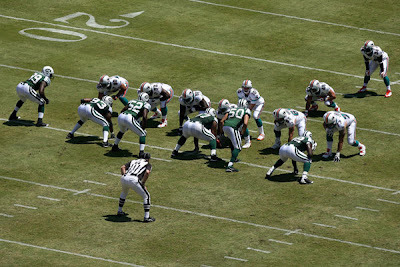 The offensive line saw its first change in 2007 after years of stability with the retirement of pro-bowl tackle Tarik Glenn. Also gone from the regular lineup was OG Rick DeMulling. This past offseason, free agency claimed longtime starter OG Jake Scott--now a Tennessee Titan. The defensive side saw the loss of DT Anthony McFarland and LB Rob Morris among other contributers to the defensive front. To make matters worse, OL Ryan Lilja has been placed on IR on the PUP list while C Jeff Saturday is currently nursing an injured knee at the start of this season. Anthony McFarland is not the only loss on the interior defensive line, however. Unfortunately, the Colts were forced to cut their emerging young DT Ed Johnson this week due to off-field conduct. 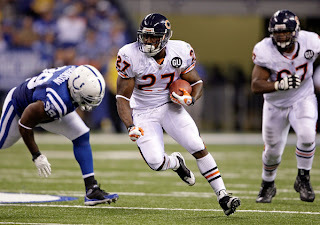 Here's how they looked on Sunday versus the Bears--with changes from 2007 highlighted in BOLD. No one hardly noticed when starting OG Stephen Neal was lost in the 2nd Quarter of the Super Bowl to a serious knee injury. 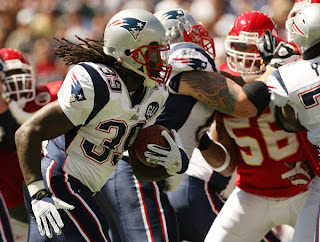 But it didn't help the Patriots any in battling the Giants defensive pressure without him. 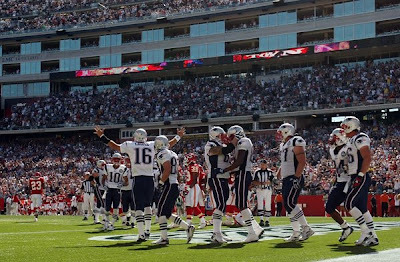 Tom Brady's usual prolific point production during the 2007 season was hindered in the Patriot's only loss in the big game. Neal was placed on the PUP list in August, but the Patriots Offensive Lineup has been around long enough under Head Coach Bill Belichick to offer some quality depth. LB Roosevelt Colvin is now a Houston Texan, but the familiar old faces of Tedy Bruschi and Mike Vrabel anchor a defense that has been playing together for awhile. Herman Edwards has been in place as the KC Head Coach long enough to start putting in the pieces that he wants on his team---and he's doing just that. Gone are a whole slew of last year's starters--almost too many to mention. But gone from the active roster are offensive lineman Kyle Turley, Chris Terry, John Welboourn, and Casey Wiegmann--now a Denver Bronco. With DE Jared Allen now in Minnesota, most of the players on the 2007 defensive line are either gone or no longer starting. So just who took the field Sunday and battled the Patriots? A lot of the victories in Eric Mangini's first season as a Head Coach in 2006 were somewhat hollow when calculated on the Football ERA formula. The formula doesn't predict or necessarily reflect wins and losses as the team that dominates the line of scrimmage can often lose in football. As such, those that predicted great things for the Jets last season were disappointed as the 'Mangenius' didn't come out of the 2007 season quite as unscathed as he did as a first year wonder. 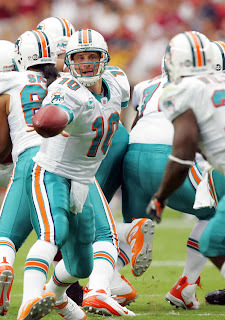 After reviewing the major issues with the team in 2007, Mangini overhauled the offensive line and made some major acquisitions for the defensive lines via free agency. Gone are offensive lineman Anthony Clement and Adrien Clarke. 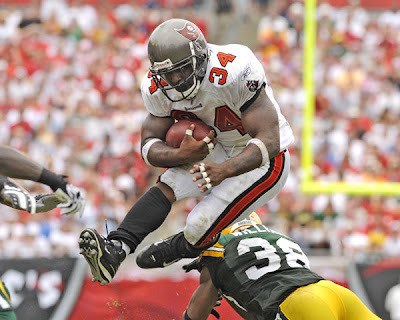 In addition, free agency claimed longtime defensive starters, Dewayne Robertson, Victor Hobson, Eric Coleman and Jonathan Vilma. On the other hand, free agency provided several of their replacements and new starters on defense in LB Calvin Pace from Arizona and DT Kris Jenkins from Carolina. 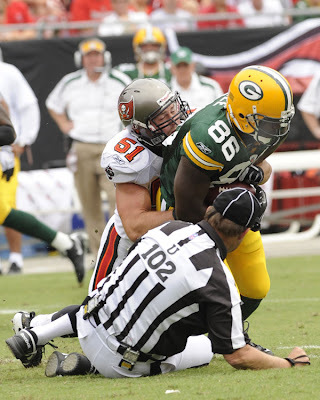 The 2008 Offense features OT Damien Woody from Detroit, and one of the biggest free agency acquisitions of the offseason in OL Alan Faneca from Pittsburgh. Here are the lineups with the changes highlighted in BOLD. Anytime you overhaul everybody in your organization from the General Manager on down, your team will reflect major changes. On top of that, if your owner has turned to Bill Parcells to be his guy, whether it be coach or the guy at the top, he will be the guy to call all the shots his way, ushering in a new era in Miami. Gone completely is the one year experiment in the hiring of Head Coach Cam Cameron. In comes Tony Sparano--not to be confused with a Soprano---as the power is definetely Parcells in this chain of command. 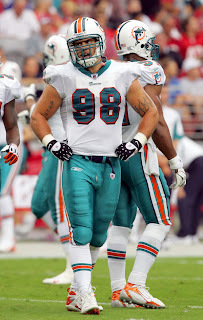 The list of players departing out and entering in through the turnstiles is too long to mention but gone is longtime defensive standouts DE Jason Taylor to Washington and LB Zach Thomas--now a Cowboy. On the other hand, you may recognize several new Dolphins as former Dallas Cowboys from the Parcells regime. Doing a game by game analysis on the outcome of Week One's matchups will allow us to also get a brief glimpse of what retooling was done in the offseason. Let's look at the some of the matchups that constituted what could be called a solid victory for the winning side. A very solid victory for Arizona which was stable in terms of coaching changes as Ken Whisenhunt enters his second year. This is reflected in a fairly stable offseason as they lost only a few key contributors but added several key players from free agency and the draft to bolster their depth. LB Clark Haggans came over from Pittsburgh to add to a decent linebacking corps to cover for the loss of Calvin Pace to the Jets. Former Titan DE Travis LaBoy was added to the defensive line as a starter replacing DE Bertrand Berry who substituted in. Meanwhile, Chike Okeafor played at the OLB spot vacated by Calvin Pace. The defense was not at full strength, however, as veteran DT Bryan Robinson (from Cincinnati)played while DT Gabe Watson is nursing a knee injury. Some might attribute the success of the Cardinal Running and Passing game to a completely intact returning starting offensive line---with the exception of C Al Johnson who was beat out by C Lyle Sendlein. Sendlein is not inexperienced, however; as he got in some significant playing time last year. In contrast to the Cardinals, San Francisco's offseason instability was reflected by the many changes to their starting lineup from that of the 2007 season. 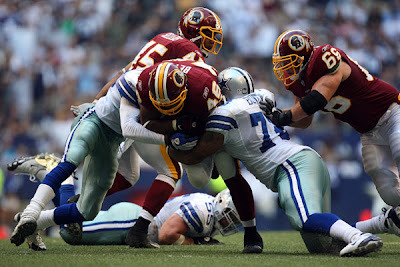 Offensive and Defensive stalwarts such as OG Larry Allen and DT Bryant Young were lost to retirement. In addition, OG Justin Smiley and LB Derek Smith both became free agent casualties as Smiley was signed by Miami while Smith went over to the Chargers. They did, however, add DE Justin Smith from Cincinnati to the defensive line. Changes in the starting lineup are highlighted in BOLD. These numbers are not meant to reflect a team's performance on an absolute scale versus the entire league----rather they have meaning only Relative to their opponent. Keep in mind that the spread created by the difference in the relative scores between two opponents is more important than the magnitude of the total result.